Fluffy bakery-style almond blueberry scones with a sweet honey-lemon glaze. Surprisingly simple and speedy, they’re the perfect compliment to your morning coffee or tea. Sunday mornings are totally made for baking and brunching. My toddler and I will often find ourselves in the kitchen measuring, whisking, and stirring our way to something magical. Now that I have a little assistant, I actually enjoy baking more than ever before. Though the process does take much much longer, it’s far more enjoyable and a memory I won’t soon forget. Ever the little food blogger, she helps with each recipe from start to finish from prep work to taste testing to photographing and untimatley, faceplantage. Though she doesn’t do dishes yet. Not cool, chickpea. Not cool. 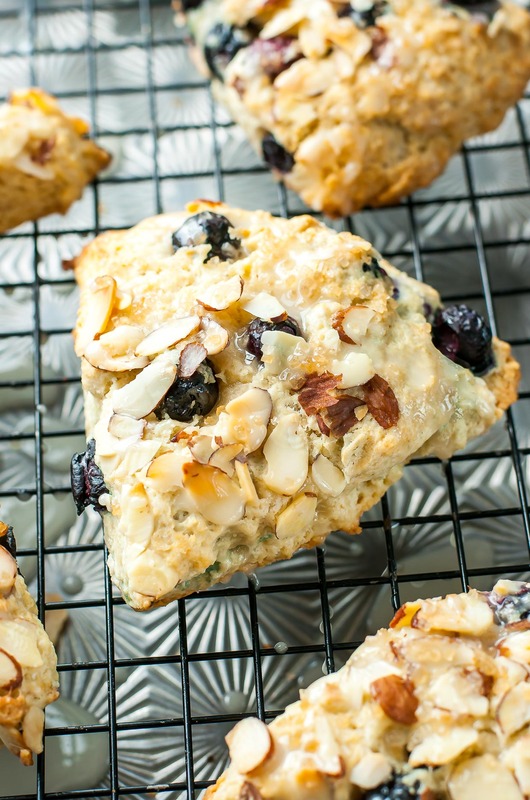 These delicious almond blueberry scones were a blast to make and even more fun to eat! Ready for the recipe? Whether you’re brunching it up with family or friends, or simply looking for a delicious treat to pair with your morning caffeine fix, these scones are sure to delight! 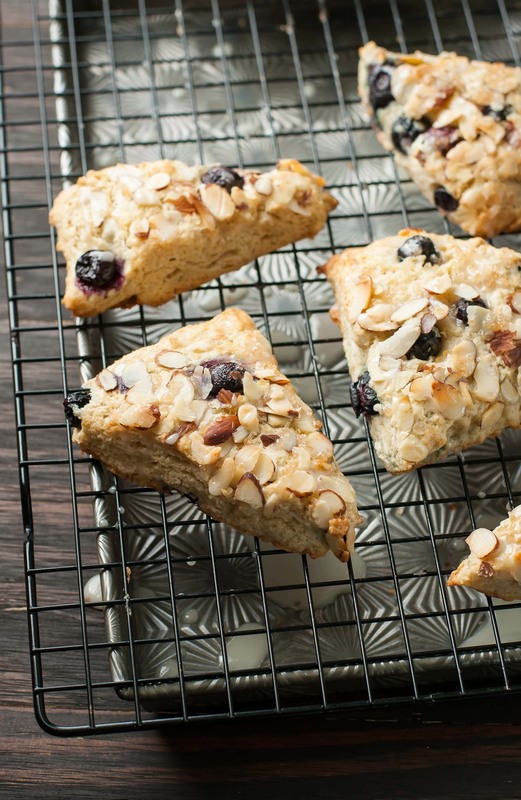 These almond blueberry scones are flaky, fluffy, and full of flavor! (I should cool it with the alliteration, eh?) We couldn’t get enough of them! I sent a few to work with the hubs for breakfast and the chickpea and I happily devoured the rest. During my early days of scone baking, I used to think they couldn’t be made without buttermilk and boy was I wrong! After finally trying them with almond milk a few years ago, I vowed never to bother with buttermilk again. We’ve never been milk drinkers around here and always have a carton or two in the fridge for our cereal. Baking with it has been a total breeze (pun intended!) and our weekend pancakes and scones wouldn’t be the same without them! Crazy for coconut? Add shredded coconut after glazing for a burst of tropical flavor! Fluffy, bakery-style almond blueberry scones with a sweet honey-lemon glaze. Cut in the butter with a pastry cutter or grate the butter into the flour using a box/cheese grater. In a separate bowl, whisk together your egg, almond milk, vanilla, and almond extract. Stir until just moistened, then carefully fold/knead in blueberries. Some will remain whole and some may smush into oblivion, blueberries have a mind of their own. At this point the mixture will probably seems fairly dry, which is absolutely what we're going for here! If needed, add a tablespoon of almond milk to moisten until slightly sticky and knead for 3-4 strokes in the bowl to mix. Sprinkle a hard surface with flour to prevent sticking and gently knead your dough until smooth, trying not to exceed 12-15 total strokes if possible. Grease a baking sheet with oil or butter, then add your dough. Shape into a 7 inch circle, top with sliced almonds and press into dough. Cut dough into 6 wedges, and nudge each wedge until spaced approx. 1/4 inch apart. While they bake, whisk together your glaze by combining powdered sugar, honey, and fresh lemon juice. Adjust thickness to taste by adding extra powdered sugar. Move to a wire rack and drizzle with glaze for a kiss of sweetness. If desired, top glaze with a light sprinkle of coarse turbinado sugar. Enjoy! They're fabulous straight from the oven or cooled to room temperature. In case you actually wind up with leftovers, wrap tightly with saran wrap and store at room temperature for up to four days. They're great for grab-and-go breakfasts and snacks and can be warmed up in the toaster oven if desired. 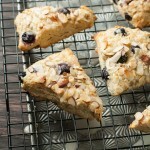 If you get a chance to try these Almond Blueberry Scones, let me know! You can leave me a comment here (LOVE checking those daily!) or tag @PEASandCRAYONS on Instagram so I can happy dance over your creations. I can’t wait to see what you whip up! Here are some of my favorite tips and tricks for making scones fluffy and fantastic! 1. Don’t over-mix the dough. The less time your hands are on it, the better. Chilly scones are fluffy scones, which is why I stress using cold milk and cold butter in the recipe. You can even freeze your butter before grating it into the flour! Toppings and fillings are beyond customizable when it comes to scones; the sky’s the limit! You can make them sweet or savory, light or indulgent, plain or positively fancy. Scones are super fast to make, but for even speedier scones, whisk together your dry ingredients and store in an airtight container the day/night/week before. When you’re ready to eat, simply cut in your butter and add the wet ingredients via the instructions above. I almost always do this when I’m recipe testing in the morning so I have minimal measuring cups to fuss with. After cutting, arrange your scones fairly close together on your baking sheet, but not touching. I usually space them around 1/4-1/2 inch apart, in the same wheel pattern that I cut them in. I feel like this helps them rise better. Ohmygosh and the almond extract! YES! If you can score a bottle, please oh please do. I’ve never used it in my scones before and LOVED the results! The almond extract gave them a biscotti-like taste that pairs oh so fabulously with the fluffy, buttery biscuit texture and was a perfect match for the almond milk and sliced almond combo. Delicious! Do you think you could use 1/2 whole wheat flour in these? Almond/blueberry is the best combo! Delicious! I’d always been afraid of making scones, but turns out it’s so easy! These tasted great, they were gone in no time! Definitely going to have to make them more often. Serial successes. I have made these over and over to rave reviews in the family. I made a double batch for an afternoon tea and everyone wanted the recipe. The moistness and flavor were a big hit. Thanks for an amazing recipe for scones with no CREAM. Enjoying the leftovers today. Thanks Jenn. I would change my rating to six stars on a five point scale. Wondering what I did wrong. My 7 inch circle spread to 13″ but luckily stayed on the cookie sheet. I baked it 30 minutes and it is still not set in the middle. Checked all the ingredients, steps and had everything cold. Wondering if I did not knead in enough flour. It was sticky and hard to score into 6 wedges. I would love advice to make this again, the flavors are wonderful. Hi Jenn, I used fresh berries that I blotted with paper towel and let rest so they were dry. I used the sweep method on the ap flour. How much weight should that be? I will definitely try less milk next time. I am still enjoying it and noticed the almond flavor is stronger the next day. Love almonds. I made these and absolutely loved them! My husband couldn’t stop eating them. They were easy to make and taste better than a bakery scone. I especially liked them because I need to drink almond milk and had plenty on hand. Ahhhh yay! 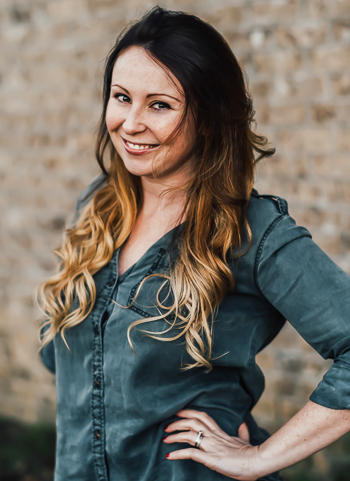 So happy to hear it Laura, thank you! Just made them! Yummy, used Almond Breeze almond coconut milk. Will be making a double batch next time?? Thanks Susan!!! I’m invited next time, right? 😉 So glad they were a hit! Could I use regular milk in place of the almond milk? I can’t resist a good scone! I wish I had one now to go with my coffee! These are such beautiful scones. The almond topping with the glaze are prefect. Thanks Carrie! I loooove baking with almond milk, it works so well! Scones are the best weekend food! Love the almond and blueberry together! Holy Amazing. These would be inhaled by me SO quickly! Thanks Crystal! Ours didn’t last long! The weekend is coming and these babies will have to happen in my kitchen! I love a good scone! Wow, these look incredible! I love scones! Blueberry and almond are made for each other. I am honestly not a huge scone person, but blueberry anything gets me every single time. These are gorgeous!! Yum! We love scones! I’ll have to try it out. Also, grating frozen butter… GENIUS! Thanks so much! I wish you could show up with a plate full of scones too! Ha!!! I posted a pic on my Instagram and tagged you. This looks SO good- I could go with a batch of this with my a-m coffee! Okay, and my pm ice cream. Thanks Arman! I wonder how they’d be with my PM wine? 😉 I’m needing a glass after this crazy day! These look lovely Jenn! And I’d totally add shredded coconut for that tropical punch! Yes PLEASE! These look amazing! What a perfect make-ahead breakfast!